Printable robotic components that, when baked, automatically fold into prescribed three-dimensional configurations. 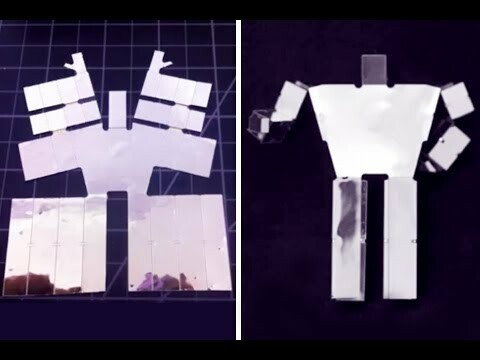 MIT researchers have developed some printable robotic components that fold into a specific 3D shape when they are ‘baked’ under heat. The team, led by Professor Daniela Rus, has introduced the “bakeable robots” in the hope that they lead to a variety of self-assembling designs that function on their own and fold together like origami. Rus’ research team demonstrate the potential of these robotic components in two new papers. One details a system that takes a digital specification of a 3D shape and produces a 2D pattern which would enable a piece of plastic to create the shape by self-folding. The second paper presents designs that show how to build electrical components (such as resistors, inductors, capacitors, sensors and actuators) with self-folding laser-cut materials. Rus hopes that these folded electronics will evolve into something of a “hardware compiler”, where different working devices can be generated for performing a variety of tasks such as cleaning the floor. The MIT research team developed a technique for precisely controlling the angles at which a heated sheet folds. For example, a PVC sheet sandwiched between two films of rigid polyester featuring slits of different sizes contracts when it is heated, causing the slits to close. The PVC becomes deformed, creating different angles where the edges of the polyester films press against each other. Producing the pattern of slits is quite a difficult process as every edge in the system moves at the same time, so it requires designing the edges in such a way that the right geometric structure is ultimately created. These printable, folding designs could perform a variety of functions, both around the home and in different industries. You can check out some of the automatically folding robotic components in the video below.